BACKGROUND: A DNA-human Ad5 (HuAd5) prime-boost malaria vaccine has been shown to protect volunteers against a controlled human malaria infection. The potency of this vaccine, however, appeared to be affected by the presence of pre-existing immunity against the HuAd5 vector. Since HuAd5 seroprevalence is very high in malaria-endemic areas of the world, HuAd5 may not be the most appropriate malaria vaccine vector. This report describes the evaluation of the seroprevalence, immunogenicity and efficacy of three newly identified gorilla adenoviruses, GC44, GC45 and GC46, as potential malaria vaccine vectors. RESULTS: The seroprevalence of GC44, GC45 and GC46 is very low, and the three vectors are not efficiently neutralized by human sera from Kenya and Ghana, two countries where malaria is endemic. In mice, a single administration of GC44, GC45 and GC46 vectors expressing a murine malaria gene, Plasmodium yoelii circumsporozoite protein (PyCSP), induced robust PyCSP-specific T cell and antibody responses that were at least as high as a comparable HuAd5-PyCSP vector. Efficacy studies in a murine malaria model indicated that a prime-boost regimen with DNA-PyCSP and GC-PyCSP vectors can protect mice against a malaria challenge. Moreover, these studies indicated that a DNA-GC46-PyCSP vaccine regimen was significantly more efficacious than a DNA-HuAd5-PyCSP regimen. 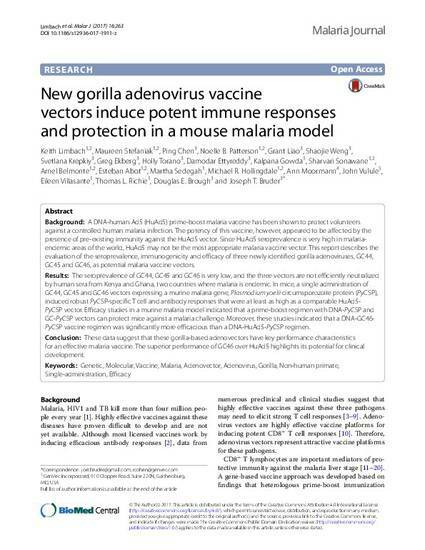 CONCLUSION: These data suggest that these gorilla-based adenovectors have key performance characteristics for an effective malaria vaccine. The superior performance of GC46 over HuAd5 highlights its potential for clinical development.